A recurring task: the tracking of large numbers of cells or particles and the analysis of their (morpho)dynamic behavior. the development of a vast spectrum of fluorescent proteins and nanocrystals and groundbreaking advances in optical microscopy technology made live imaging of dynamic processes at the cellular and molecular levels. simplest: link every segmented cell in any given frame to the nearest cell in the next frame, where “nearest” may refer not only to spatial distance but also to difference in intensity, volume, orientation, and other features. Individual proteins or other (macro) molecular complexes within cells (collectively referred to as particles) are hardly (if at all) visible in bright field or phase-contrast microscopy and require fluorescent labeling and imaging. 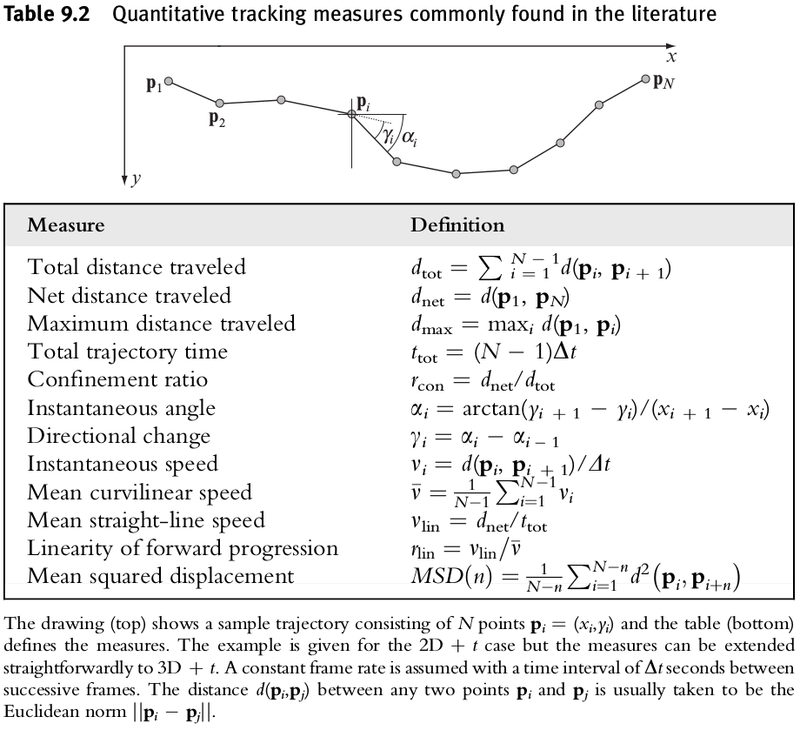 pure random walk (such as Brownian motion of particles): $MSD(t) = cDt$, with $c=4$ in 2D and $c=6$ in 3D, and where $D$ denotes the so-called diffusion coefficient. motion impeded by obstacles: $MSD(t)=cDt^\alpha$ with $\alpha < 1$. motion confined to some region: $MSD(t)=R[1-a_1\exp(-a_2cDt/R)]$. directed motion (flow) in addition to diffusion: $MSD(t)=cDt+(vt)^2$. measures of size and orientation: perimeter (surface area), area (volume), and the major and minor axes. aggregation: object based (a histogram of the per-object mean speeds will reveal objects consisting of two subpopulations) or frame based (detection of different modes of motion).